Breastfeeding means a complete emptying of energy and women who lactate need to constantly recharge with food and water to be able to give inexhaustibly. Of course, this is much easier when having support from the people around, who help in making sure mama is eating and drinking sufficiently. It might be plenty anyway with the challenges this spiritual and physical act offers. To become one with the act of giving is one example. To have the energy to be awake at night is another one. My experiences from yoga and shamanism really helped me when I was awake with Orion during the nightly hours the first couple months. I felt it important to still be present, focused and awake during the night shifts and at the same time try to create an energy flow so that I could also regain my energy. To do this, I use techniques from Yoga and Meditation. Feel free to try them out and share in the comments below how it felt for you! It is crucial to sit properly and comfortable when breastfeeding a small baby. Sitting properly affects posture and the physical energy, the body’s healing process, the contact with the baby. What is more, during nighttime I find it is easier to stay focused and awake. That is why I go to the room with my comfy breastfeeding chair. Even during the night! It encourages me to sit properly and has a cozy and relaxed light next to it. Immediately, baby and me get into cozy mood and Orion is soon back to sleep. Personally, I find sitting comfortable is of high value because time seems to pass faster and it’s easier to stay awake. Uyajji (”Oceans’s Breath” see video). This technique copies the body’s natural sleep sound. Uyajji breath cradles my baby back into sleep while I stay focused, yet at the same time easily go back to sleep when we get back to bed. Full Yogic Breath is full breath through the body, made in a circle-focused motion, completely filling the body with air and completely emptying it. These Pranayamas strengthen the spine and lower back, gives me energy and make the energy move freely in and out through the body so that I can continue to give inexhaustibly and stay focused on my task. During the day or if I feel energized during the night, I use breastfeeding time to strengthen and tune the uterus through an exercise called menstrual /reversed mula bandha. These are soft squeeze exercises with the vaginal walls made on exhalations. Inhale and feel the air move in through the pelvis and lower back, on an exhale lightly squeeze the vaginal walls inwards and upwards. Release and breathe normally before you do the next one. Only do a few at a time in the beginning and don’t start too soon after delivery! The very first weeks (after bleeding has stopped) Womb Yoga therapy recommended doing yogini mula bandhas lying down. Learn more in coming posts about postnatal yoga. Bija Mantra Meditation. Both Orion and me loved it from the start! I did this meditation throughout pregnancy so he was already familiar with the sounds. While breastfeeding, I chant seed mantras for each chakra: LAM, VAM, RAM, YAM, HAM, AUM and close with 7 OMs. Simply vibrating MMMM is also an option, or sing songs and mantras of course. I promise you, the baby loves it and the vibrations create calm in both of your bodies and mind while it deepens your bond. Every now and again it might also be a good idea to do simple neck rolls and observe your posture; scan the body to see if you are sitting up tall, are relaxed and have straight shoulders neck and spine. You can read more on yoga after birth later in the series. 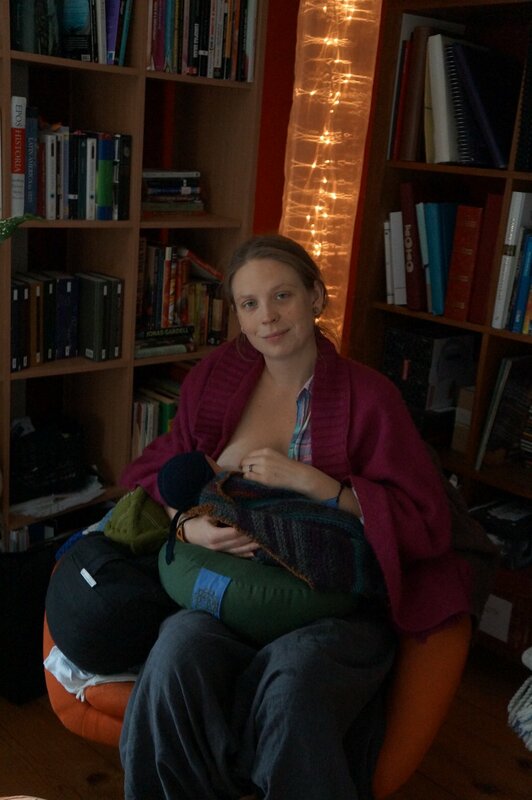 I see breastfeeding as an opportunity to meditate and the examples above are only a few ways in which I do so. Me and baby Orion create a moment together, while at the same time I do my practice of care-taking myself. These moments are so important and beautiful to me and I am grateful for this special time together, I know it wont last for many months more…. Now when Orion is 4 months we are rarely up during night anymore but during daytime we take the time to meditate together with focus (Trataka), breathing exercises (pranayama) and song (Chanting). We have a beautiful moment together, creating strength energy in our bodies. Sign up for my international Newsletter! Receive free yoga and healing inspiration for mamas, babies and women.